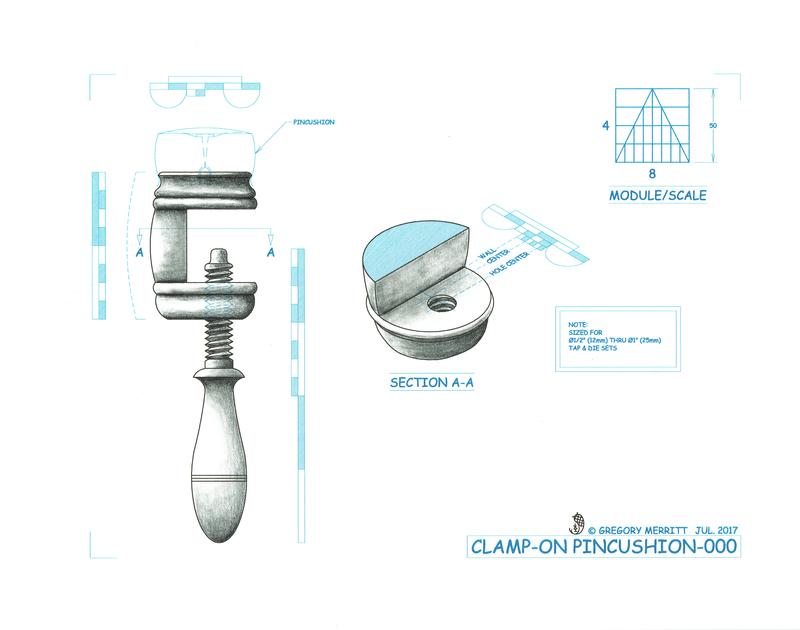 The plan at the end of my last post was simply to complete the second version of clamp-on pincushion and complete the design drawing for the first version. A simple conversation changed my plans. My mother stopped by over the past weekend and while showing her the pincushions I have been working on, management made a comment about something she had put back from her grandmother. 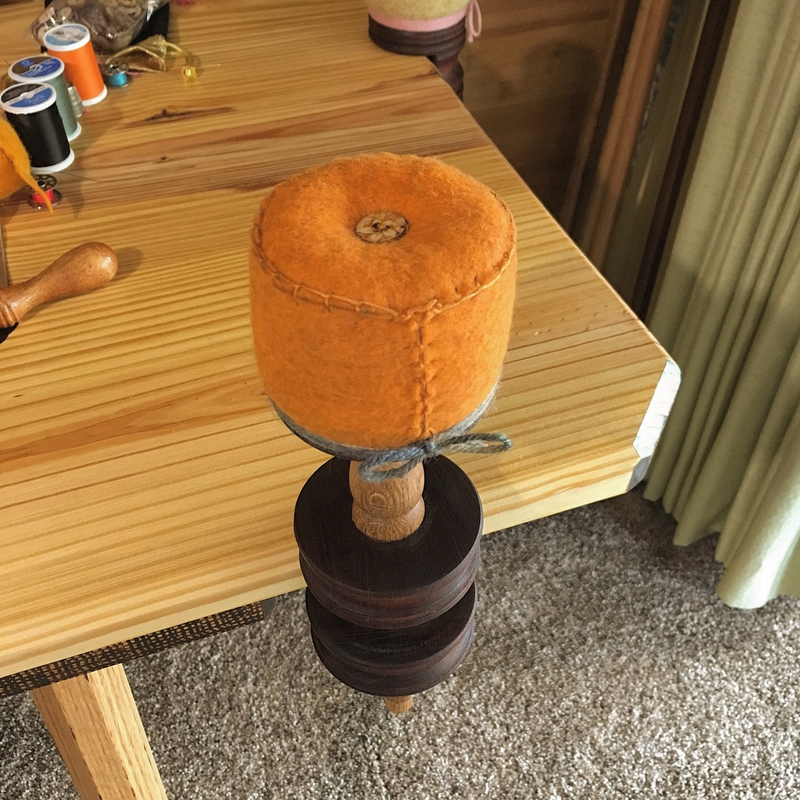 A pincushion that her grandmother had made her that held scissors, bobbins and a thimble. Since her grandmother had passed away many years ago, management no longer uses it, but keeps it as a memento. 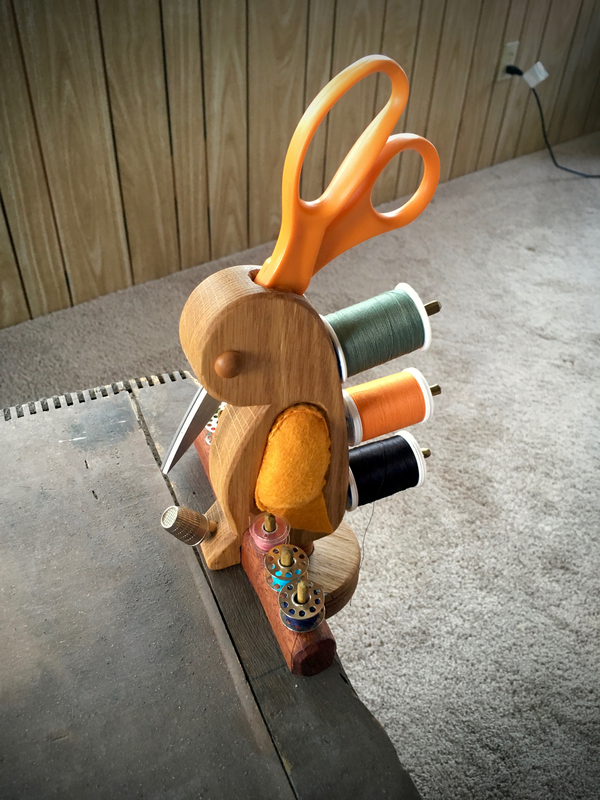 That set my wheels turning and I began searching for ideas for a sewing caddy. More on that in a minute. I did manage to finish version #2 of the clamp-on pincushions. After the third coat of Tried & True finish had cured, I made the pincushion for it. I’ve been using felt for these pincushions and it seems to be working well. The nice thing about the felt is that it doesn’t require any fancy seems. A simple blanket stitch that butts the edges together is all that is needed. 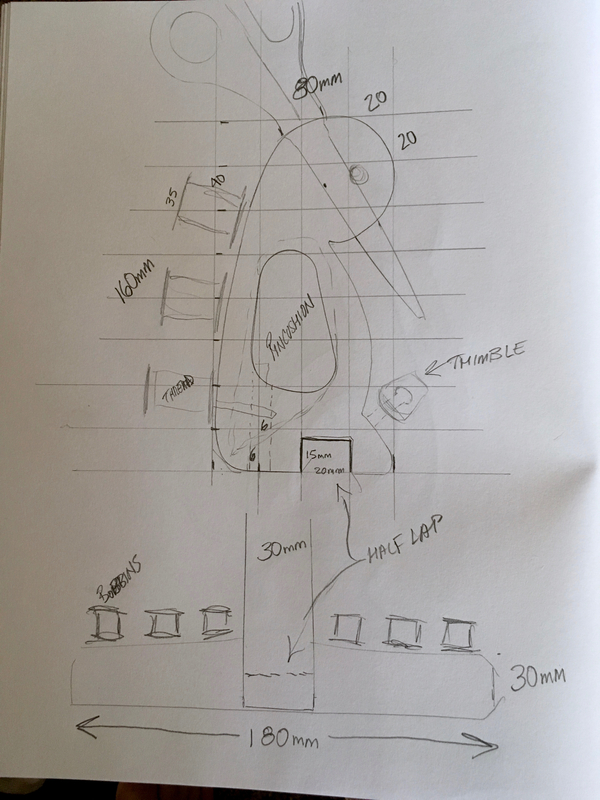 I also promised to complete the design drawing for first version. So here you go. OK, that brings me back to the sewing caddy. After a bunch of sketches I came up with a design that I liked. The general idea is that it is a bird theme. 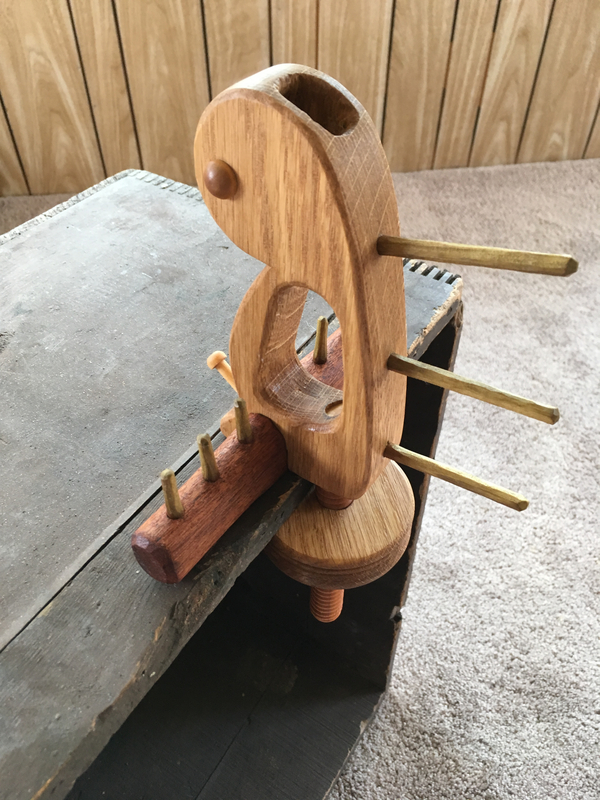 The head holds the scissors, there are pegs down its back to hold thread spools, there is a peg at its feet to hold a thimble and the wings form the pincushion. 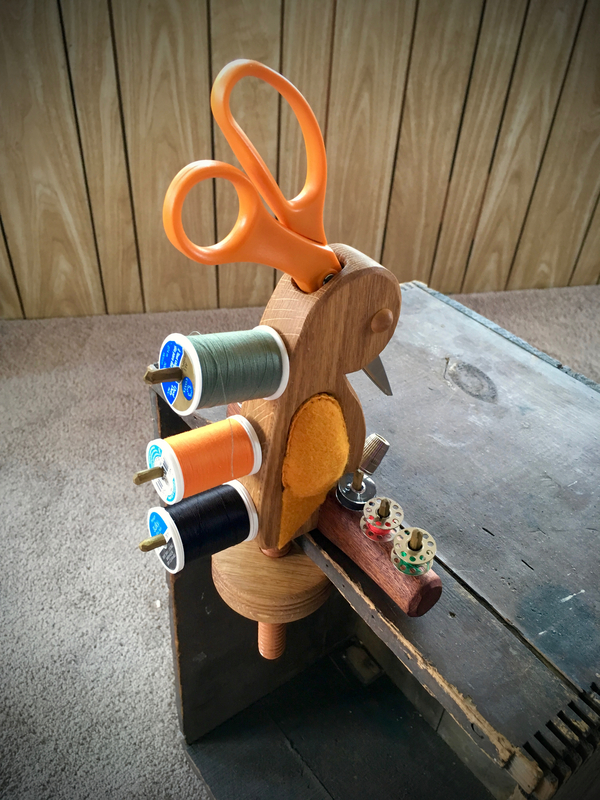 Management suggested that it should also hold sewing machine bobbins and I added that feature by putting the bird on a perch. 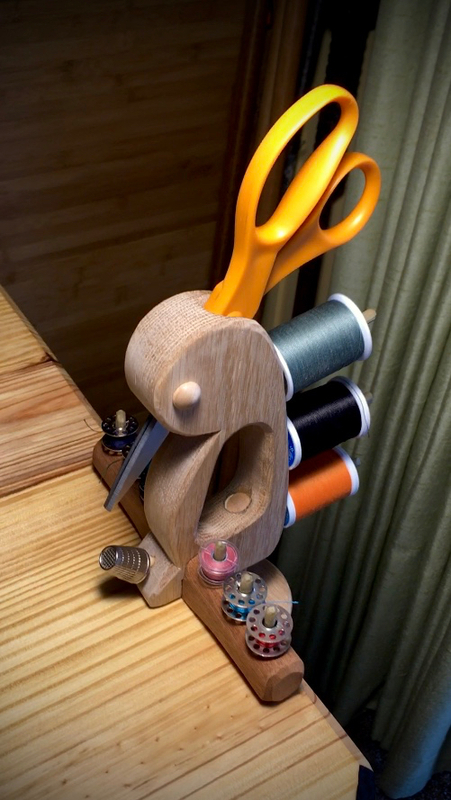 The whole thing clamps on the edge of a table in the same manner as the second version of clamp-on pincushions. With my design in hand I went out to the shop to see if I could bring it into being. After a few hours, I had the thing together. Over the following days I added the finish, made the pincushion and worked up a proper design drawing. Well that should do it for my pincushion making for a while. Although I’m sure there will be a few more in my future to give as gifts. 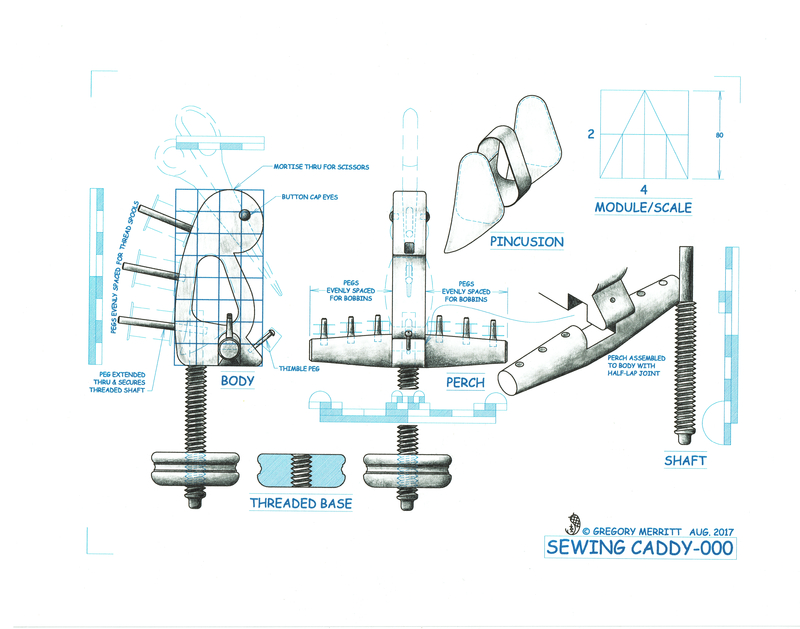 This entry was posted in Clamp-On Pincushions, Design, Illustrating, Sewing Caddy and tagged pincushion, Tried and True. Bookmark the permalink. Cool stuff, Greg. Your design skill always amazes me. Thanks Matt. I’m pretty good with function, but aesthetics are always a struggle. Sometimes I get lucky. Nice work. I read the part about “management” to my wife who laughed. Very cool, it looks like one of those items your friends will tell it’ll make you rich if you market it. Really like the design and bird theme, good work Greg! LOL…only the “friends” who want me to starve. Thanks though, the bird theme is a common one with these sewing caddys. The beak of scissors just naturally sends you down that path. My wife wants one. Really great idea. Thank you. Have fun building her one. My wife wants one like that and she don’t even sew!!! So that should tell you how much I hate your designs because I didn’t came up with it myself! P.S. : I smashed the modem router at home and next her cell phone will disappear mysteriously ! How much did she paid you for that comment… or did ‘Mrs Manager’ took over the blog??? 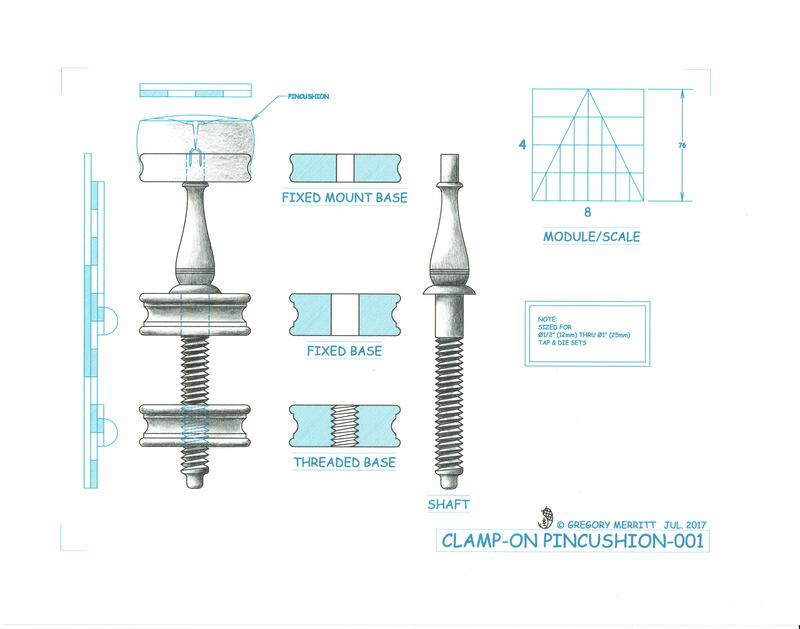 Your modesty is commendable Greg, your illustrations put to shame much of the work I have seen from qualified designers. The ideas and practical considerations have resulted in a nicely resolved piece along with your obvious hand skills ability. Now for some serious testing! I appreciate that Gav. Given enough time and paper, I can usually come up with something that works. If you make one of these let me know how it turns out. 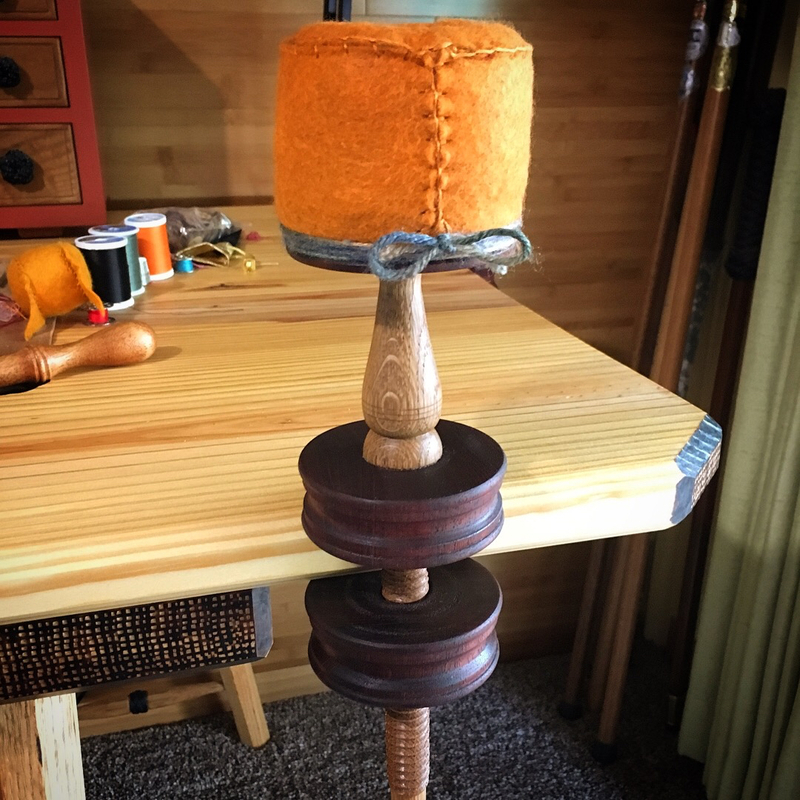 The pincushions are such a great turning project. Thanks! 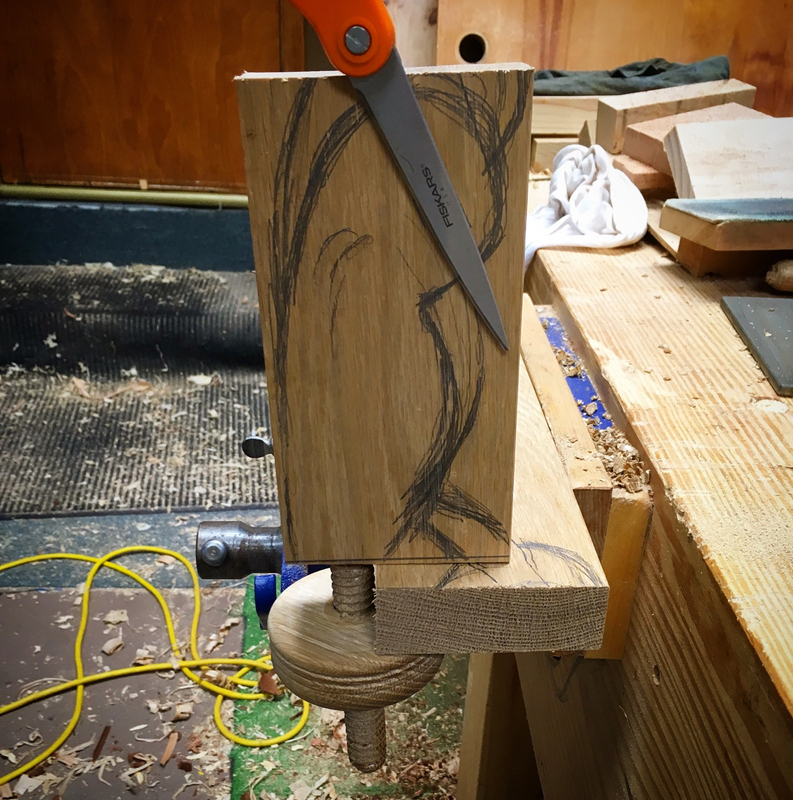 You write very well about your woodworking.